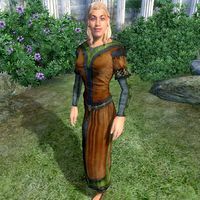 Praxedes Afranius is an Imperial commoner who lives with her two brothers, Surius and Ancus Afranius, in the Imperial City Temple District. While Surius works as an honest guard at Umbacano Manor and Ancus is a member of the Thieves Guild, Praxedes fits somewhere in between; she lives a relatively quiet existence in the big city, although she spends most of her evenings in the Waterfront District, at times visiting a rather controversial resident. She sleeps in the upstairs area of Surius' house every night between midnight and 6am and always starts the day with a two-hour breakfast on the ground floor. At 8am, she leaves the house and heads to the Arboretum where she strolls around amid the many statues of the Nine Divines. On all weekdays (Morndas to Fredas) she stays there until 6pm, then travels to the Waterfront District for a two-hour dinner at the Bloated Float Inn. Most of her evenings during weekdays are spent strolling around inside the Afranius residence, with the exception of Tirdas, when she visits her friend Armand Christophe in his shack on the Waterfront. Her weekends are more varied; on both Loredas and Sundas she will take her breakfast as usual at 6am, then head to the Arboretum at 8am. On Loredas, she leaves the Arboretum again at 10am, takes a walk down Green Emperor Way, then heads back to the statues at 2pm. She skips dinner and stays in the Arboretum until 8pm when she visits Armand once again, staying there until her bedtime at midnight. Sundas is different as well; after breakfast and arriving in the Arboretum, Praxedes heads back to the Temple District at noon and wanders around near the Temple of the One until 4pm, then spends the rest of the afternoon in the Arboretum. Once again, she skips dinner and returns home at 8pm for a bit of wandering before bedtime. On the 11th of each month, when the clock strikes midnight, Praxedes skips her bedtime and leaves the Imperial City for a two-day trip to Chorrol. She crosses the Talos Bridge and heads northwest on the Black Road, passing through both Fort Ash and Weynon Priory. After eight hours of walking, she usually enters Chorrol through the southern gate at 8am. Once there, she enters The Oak and Crosier where she hangs out in the taproom, chatting with stuck-up innkeeper Talasma and the many regulars. At midnight on the 13th, she heads back to her brothers in the Imperial City. She wears a set of simple middle-class attire; a russet felt outfit with matching shoes. She carries a copy of the key to Surius' house and a small amount of gold. Not exactly talkative, Praxedes will only introduce herself briefly: "I'm Praxedes Afranius. My brothers and I share a house in the Temple District." When asked about the Imperial City, she will once again be brief and stick to the subject: "It is a very fashionable address, of course, but we live simply."